The URV stand at the China Expo in Beijing. 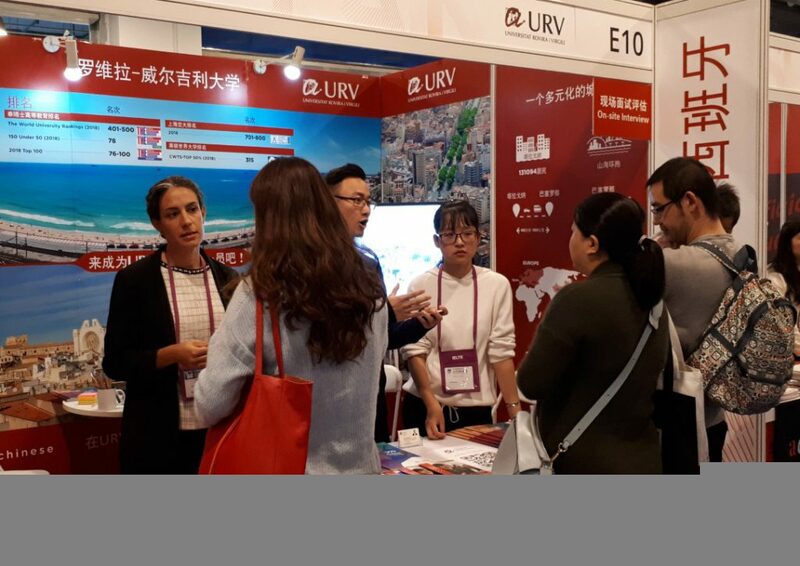 On 20 and 21 October, the URV and the FURV attended the China Education Expo 2018 to promote their course offer for the 2019-20 academic year. The URV participated along with 17 other Spanish universities in the “Study in Spain” pavilion organised by the Spanish Institute for Foreign Trade (ICEX). The URV’s attendance was complemented by interviews with representatives of the Education Council and the Spanish Embassy and with visits to six Chinese universities in Shanghai, Suqian, Shaoxing, Sichuan and Tianjin. These visits were organised by the agency Chinese and Western Exchanges, which collaborates with the URV Foundation to promote the courses offered by the URV’s Centre for Hispanic Studies (CEH). The URV first participated in this fair in 2015 and decided to attend for a third time this year given the growing interest in China in the Spanish language. Thus, in response to the specific needs of Chinese students, the CEH has designed a special programme to provide Chinese students with the language skills needed to study a master’s degree at the URV. In addition to this new programme, the CEH also has considerable experience in providing a programme that enables Chinese students to study the third or fourth year of their bachelor’s degrees in Spanish at the URV. The members of the URV-FURV delegation that attended this fair were Titón Sancho, from the Master’s Support Office, Blanca Domingo, conference manager and Study Abroad coordinator at the URV Foundation, and Álvaro Sun, a Chinese ex-student at the URV who was on hand to describe his personal experiences of studying at the URV and living in Tarragona.